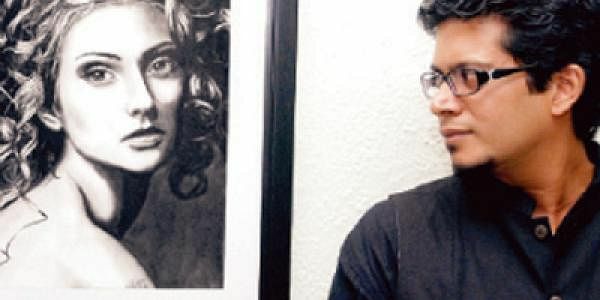 Life is always in black and white for Rupesh Patric. He sits in an creative corner in his balcony clenching a pitch black charcoal stick between his index finger and thumb, lost in a world that he conjures up in black and white every night. When daylight emerges, he heads off to his office where he works as a technology consultant for Microsoft, and when night falls, one can find him hunched over a desk sketching the world in charcoal or graphite. “I am not a trained artist. I grew up wanting to study fine arts. But I gave in to my parent’s wishes and pursued engineering,” says Patric. But that didn’t stop the man from sketching. So far, he has had five art exhibitions and has mesmerised art lovers with his impeccable detailing. What strikes people when they first see Patric’s works is the ‘genuineness’ of the subjects. From far and even up close, they could pass for photographs—the detailing is picture perfect. “I sometimes stay up till the wee hours of the morning to finish my sketches,” he says. His hard work has made him the star artist even in his office. In 2005, when Bill Gates visited the Microsoft office in Bangalore, the management didn’t know what to gift him. After a brainstorming session, they asked Patric to make a portrait of Gates which he presented proudly during the Microsoft maestro’s visit. Finding subjects require inspiration, and for Patric, inspiration comes in many forms. “My muse keeps changing. It could be anything I see. I write the catchy things I come across on my phone and eventually it could turn out to be the theme for my series,” explains the artist. His latest series is called Crossover, which he started with just a couple of sketches in 2010. There are about 13 pieces in the collection now. Crossover is a series of charcoal works on canvas. “Canvas is not charcoal powder friendly,” points out Patric. But a fixated spray can keep the charcoal intact. “I took a long time to complete the first one. I posted it on Facebook and got quite good feedback,” he says. According to the artist, he gets the most creative criticism through Facebook. For Patric, commercialisation of his art is also a way to spread awareness about the causes that he supports. So far, he has done three charity art shows for various NGOs in the city, and is planning for another one soon. “I imbibed these values when I was growing up. In my 11th and 12th, I was also part of the NCC where I was involved in a lot of work, especially with Missionaries of Charity. Now in Bangalore, I have a huge network of friends. I just want to make sure that everything goes to the right hands,” he says.